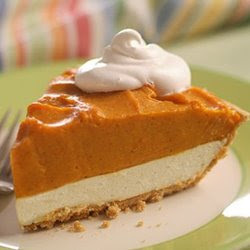 You know how people greet each other just before Thanksgiving with “Have a Happy Turkey Day!” Well, we prefer “Have a Happy Pumpkin Pie Day!” because for us, Thanksgiving is all about the pumpkin pie. Turkey’s a good thing, sure, and you have to love all those sides…sweet potatoes, candied yams, cranberry sauce, cornbread, mashed potatoes, vegetables galore…but nothing caps off a great Thanksgiving like a slice of perfect pumpkin pie. So, on Thanksgiving, we’re thankful for a myriad of things: our health, our fantastic family and friends, the wonderful guests we’ve met, and of course, we’ll say a big “thanks” to whoever came up with the first recipe for pumpkin pie. This entry was posted in Uncategorized and tagged festivals and special events, food and drink by Inn on Mill Creek. Bookmark the permalink.